Are hackers' passwords stronger than regular passwords? Over the years of fighting malware, the avast! Virus Lab has gathered many samples of various back-doors, bots and shells. Some of them are protected with a password encoded in MD5, SHA1 or in plain text, so it was good way to start. I looked at 40,000 samples of hackers' passwords and found that nearly 2,000 were unique and 1,255 of those were in plain text. Another 346 passwords were easily cracked from MD5 hashes, because they were shorter than 9 characters. That gave me a total of 1,601 passwords and 300 hashes. I created statistics from those words, and here are my findings. There were also passwords that don't use characters from an English keyboard. But there was still a 90% chance it could be a normal word, maybe with some number in it. No less than 9% of the passwords could be found in an English dictionary. The table on the right shows which characters are used in hackers' passwords. The first row means that 58% of passwords contained only lower-case alphabet characters a-z. One password is not included in this table because I found this hash: d41d8cd98f00b204e9800998ecf8427e. It is a hash of "empty string." The table on the right shows how long hackers' passwords are. The average password length is 6 characters. There were only 52 passwords longer than 12 characters. Generally, there are many variations of words from the IT field and English words, including names and whole sentences, but almost none of them contain uppercase letters. Some of the passwords are created as English words but using leet speak. This is a way of writing where you use numbers that look like letters. For example, A looks like 4, I looks like 1. Using leet speak a character with letters "o, i, e, a, s, t" are replaced with their equivalent 0, 1, 3, 4, 5, 7. On the table below the occurrence of lower-case alpha characters used in passwords is displayed. The most used character is letter a and letters f, j, v, w, y, z are used very seldom. This is the largest set of characters so 38 occurrences of lower-case letter q is still more frequently used than the upper-case character set where S has 28 occurrences. 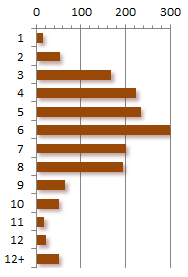 In the special character set, lower-case q is used almost the same as most frequently used "." with count of 42. 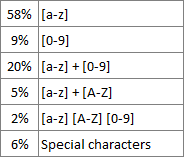 The next table shows which special characters are preferred by hackers and how much they use them to improve passwords. The first character in this table is a space and it revealed one interesting thing: One or five spaces could be a pretty clever password, but not very secure as it gets tested right from the beginning. Not all special characters are listed below because " , = ~ | [ ] " were not used at all. When I compare all findings from the graphs above, I can tell that the average hackers' password will be at a maximum six characters long, contain lower case letters and numbers and it's derived from the English language. That was not as hard as I expected, and most of hackers' passwords are even weaker than those that normal people use, as you can find in this article for example. But what if I stumble on a hacker who actually uses a strong password and cares about security? Then I need to have a character set with special characters, but as small as possible so a brute force attack will take only days instead of months. If I use only the previous statistics, I can made up two character sets that should hit most passwords used in various shells and bots. When the dictionary fails, there are not many ways to continue, but there is always brute force.